A new ed., 2. ed., repr. Argo Record Company, Spoken Arts 753 1959. Und leb allein im Wald, von Bienen umsummt. Der Abend ein Geräusch von Hänflingsflügeln sein. Ganz tief im Herzen hör ich den See. 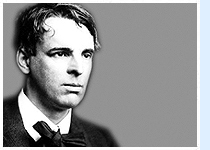 Born in Dublin, William Butler Yeats' family moved to London when he was two. He lived there until he was sixteen. His mother's traditional Irish songs and stories and holiday visits to Co. Sligo kept the connection to Ireland strong. Yeats studied at the Dublin Metropolitan School of Art, his first collection of poetry being published in 1889: “The Wanderings of Oisin and other poems”. To the middle period of his work belongs his failed courtship of the beautiful nationalist, Maud Gonne and his founding in 1899 of the Abbey Theatre in Dublin which became a focus for many of the writers of the Irish Revival of which Yeats was a key figure. Yeats wrote prolifically for the stage but also continued with his poetry. As events in Ireland began to take a bloody turn, Yeats' poems increasingly addressed public themes as in 'Easter 1916', his troubled commemoration of the Easter uprising. He entered official political life when he was elected to the Senate, the upper house of the new Free State, in 1922. His personal life was also changing: after a final rejection from Maud Gonne and then from her daughter, Yeats married Georgie Hyde Lees. Her interest in spiritualism echoed Yeats' and his explorations in this area informed some of his powerful visionary poems. Yeats' was now entering his poetic maturity; later collections “The Tower” and “The Winding Stair” are often considered his best. His reputation by this time was secure - he was awarded the Nobel Prize for Literature in 1923. Yeats died in Roquebrune-Cap-Martin, France, in 1939 and was buried in Drumcliffe Church, Co. Sligo as he'd requested. Ausgewählte Gedichte, 1 - 1971; Erzählungen, 2 - 1971; Dramen 1, 3 - 1972; Dramen 2, 4 - 1972; Essays und Einführungen, 5 - 1972; Autobiographie, 6 - 1973.